复式投注8十1多少钱:‘It’s insane’ – Olympic medal winner’s reaction to 12-year-old Ugandan water-carriers. Peter Chambers knows a thing or two about thirst. An elite athlete who won a silver medal at the 2012 London Olympics and Gold at the European Championships for rowing, his body is in optimum condition, and he knows better than most how essential proper hydration is. Travelling with the charity Tearfund, Peter and his professional athlete brother Richard stayed for a week in a village in the Ugandan mountains and tried to keep up with Doreen (aged 13) and Jouvllet (aged 12) as they went about their daily routine of fetching water for their families. For medal-winning athletes this was a tough challenge. But for these two young girls carrying half their body weight in water 1500 feet up a mountain was just an ordinary day. They had been doing it since they were five years old. And there was no time for dawdling or resting – they had to get to school for 9.00am sharp. And if that wasn’t tough enough, they had to do it again in the evening, often avoiding heckling from the men returning from work. Peter and his brother were so challenged by the girls that they partnered with Tearfund for their One Big Mountain campaign, which raised over £230,000, helping to provide clean water for the village and the surrounding area, so girls like Doreen and Jouvllet no longer need to fetch their water from so far away. 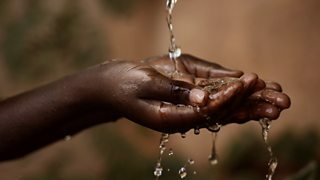 The Sunday Worship broadcast for Lent 2 – Invitation to Service – includes songs, prayers and readings on the theme of thirst and will help anyone seeking to develop their sense of what it is to serve. A look at the ethical and religious issues of the week. Regular broadcast of Christian worship and music. Ethical and religious discussion that examines some of the larger questions of life.